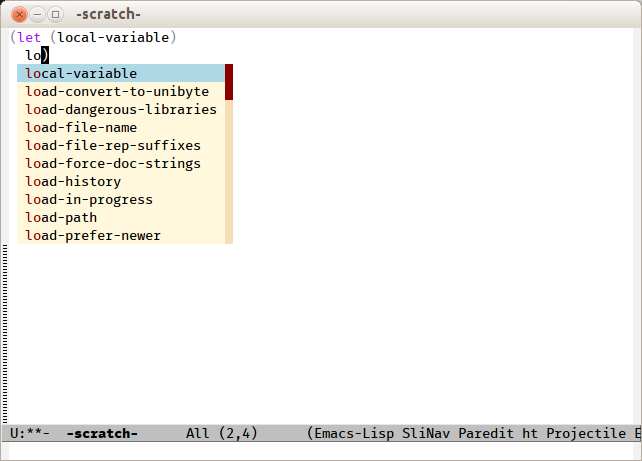 Company is a text completion framework for Emacs. The name stands for "complete anything". It uses pluggable back-ends and front-ends to retrieve and display completion candidates. It comes with several back-ends such as Elisp, Clang, Semantic, Eclim, Ropemacs, Ispell, CMake, BBDB, Yasnippet, dabbrev, etags, gtags, files, keywords and a few others. The CAPF back-end provides a bridge to the standard completion-at-point-functions facility, and thus works with any major mode that defines a proper completion function. This package is part of GNU ELPA (M-x list-packages). Advanced users can also download the development snapshot. Once installed, enable company-mode with M-x company-mode. Completion will start automatically after you type a few letters. 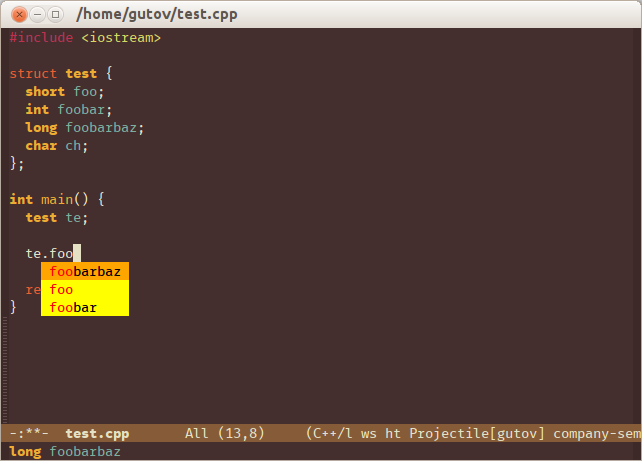 Use M-n and M-p to select, <return> to complete or <tab> to complete the common part. Search through the completions with C-s, C-r and C-o. Press M-(digit) to quickly complete with one of the first 10 candidates. Type M-x company-complete to initiate completion manually. Bind this command to a key combination of your choice. When the completion candidates are shown, press <f1> to display the documentation for the selected candidate, or C-w to see its source. Not all back-ends support this. To see or change the list of enabled back-ends, type M-x customize-variable RET company-backends. Also see its description for information on writing a back-end. For information on specific back-ends, also check out the comments inside the respective files. For more information, type M-x describe-function RET company-mode. To customize other aspects of its behavior, type M-x customize-group RET company. If you experience any problems or have a feature request, please use the issue tracker. Company is subject to the same copyright assignment policy as Emacs itself, org-mode, CEDET and other packages in GNU ELPA. Any legally significant contributions can only be accepted after the author has completed their paperwork. Please ask for the request form, and we'll send it to you.